Wood is a powerful player in the residential and mid-size building sector. But what do steel and concrete have to offer? According to folklore, when lumberjack Paul Bunyan went for a walk, the whole valley shook. The same might be said of the wood sector in Ontario. It is big and powerful and has been a mover and shaker in the residential and mid-size building sector in Ontario long before we were called Upper Canada. If you’re reading this, there’s a good chance the home you grew up in or the one you’re currently residing in was built primarily of wood. Wood’s strength is based on our history and its sheer availability. According to Green Blizzard Inc., at last count Canada had 318 billion trees. That’s 8,953 trees per person—the best per-person rate in the world. It’s not a stretch to say that Canadian business was built on beaver pelts and 2-by-4s. Ontario’s wood fibre stock provides a diverse abundance. It’s organic, versatile, malleable and can be easily cut down to size. Wood-frame construction (especially at the residential build level) can incorporate dimensional lumber, engineered wood products and structural wood panel sheathing into wall, floor and roof assemblies that are robust, economical and quick to build. That said, current wood-frame technology is also the result of years of development and research. But will it stay dominant for the foreseeable future? While Mother Nature kindly provides us with this remarkable and renewable resource, man’s inventiveness has unearthed all kinds of other building materials. Two are concrete and steel, and proponents say it’s time builders and developers embraced their usage, too. Meet Tony DiGiovanni, national director of business development at Bailey Metal Products Limited. DiGiovanni is pumped. He is always pumped—especially now that his Concord-based firm, which has served Canada’s commercial and residential construction markets since 1950, has dipped a not-so-tentative toe in the mid-size building market. DiGiovanni is a huge advocate for the use of cold-form steel, especially at the mid-rise level, either commercial or residential. That includes anything from retirement homes, to student residents, to six-storey condo structures. DiGiovanni says cold-form steel is thin, strong, versatile, easy to handle and comes with a galvanized coating. Compared to wood, it doesn’t rot, shrink, attract hungry termites and is really hard to burn. It doesn’t age either, and it’s fully recyclable. Steel brings with it a permanence that is attractive to owners looking to extend a building’s lifespan. And here’s the added kicker: it is now built in formed sheets, like wood, and that speeds up the building process. The C-stud 6-inch panel is to the steel industry what the 2-by-4 once was to the wood business, DiGiovanni says. There’s no less enthusiasm with Murray Snider, who, like a downed power line, crackles with energy. Snider is the president and CEO of Nudura, the largest supplier of insulated concrete forms (ICF) in the world. Coincidence or not, Nudura’s head office is in Barrie, and the Ontario market is considered the highest concentration of ICF construction in North America. The ICF system of formwork for reinforced concrete is made with a rigid thermal insulation that stays in place as a permanent interior and exterior substrate for walls, floors and, yes, even roofs. The forms are interlocking modular units that are dry-stacked (without mortar) and then filled with concrete. The units lock together somewhat like Lego bricks and create a form for the structural walls or floors of a building. ICF is a unique Canadian invention, and construction has become more commonplace for both low-rise commercial and high-performance residential construction. It is energy efficient and also resistant to natural disasters. Snider bristles at the idea that concrete and steel are niche players in residential construction. He points to his company’s long list of projects around the world as a testimonial to the strengths and permanence of an ICF build. But hey, not so fast. The Canadian wood industry has its own commanding spokesperson, and he is world-famous. Meet the Vancouver-based founder of Michael Green Architecture (MGA). Green was keynote speaker at the Ontario Tall Wood Symposium, held in Woodbridge earlier this year. Green is aptly named. He’s a huge advocate for a greener world, and his firm is a champion of a building material that is one of the world’s most organic and renewal resources—wood. Green has turned his love of wood products into a huge business, and MGA has become one of the world’s top designers of wood structures. His 2013 TED Talk has more than one million views. Perhaps the subject matter is what drew so much interest: Why are buildings made of wood only a few stories high when trees found in nature are remarkable for their height? To that end, MGA has designed everything from the Ronald McDonald House in Vancouver, to the Wood Innovation and Design Centre in downtown Prince George, B.C., to the seven-storey office building in Minneapolis’ North Loop neighbourhood—the largest mass timber building in the United States. While Green has worked on some of the world’s largest concrete and steel and glass structures in his past, he’s been an advocate for wood ever since his grandfather, a woodworker, taught him to honour a tree’s life by making a building as beautiful as you possibly can. Green likes to say Mother Nature has her fingerprints on all his buildings. Green would like his building material of choice to evolve from its traditional place as a residential and mid-size powerhouse to also include tall buildings, even skyscrapers. And he’s far from alone. Steven Street, technical manager of Wood Works!/Canada Wood Council, one of the organizers of the Tall Wood Symposium, agrees. Born in London, England, Street has noted in the past that the biggest advantage wood has over steel and concrete is that it can lower the cost of a project by 20%. And as Green notes, steel and concrete simply can’t match the light weight that wood provides. Street also feels that the use of CLT (cross-laminated timber) has upped the ante for wood builders in larger projects across Europe, and that has spilled into North America. MGA’s design in Minneapolis is just one example. In fact, Street thinks the ability of wood products to be pre-processed in factories, cut to size using computer software and then assembled on build sites, will change the way buildings are erected in the future, from residential to high-rise. While wood reaches for the sky, concrete and steel are looking to find some street cred in the residential and mid-size markets. The debate about which products are best is passionate, and the conclusion is clear: There are now multiple options for developers and customers. While Canada was blessed with an abundance of wood for building, in other places around the world, it was a different story. In Africa, wood was scarce and usage limited. The go-to product for Egyptians was stone, and their glorious pyramids are a testament to the power of the interlocking process. One of the most creative citizens in Rome decided to mix lime with volcanic rock and invent something called concretus. It was refined in the 1800s in England, and today, it has become a mainstay of the building industry, both in Europe and here. Concrete projects such as the Parthenon in Greece and Colosseum in Rome, the Hoover Dam, CN Tower and even the 407 ETR toll highway north of Toronto are examples of its permanence and its many usages. But concrete struggles to capture a bigger portion of the residential and mid-size markets in Ontario for one reason: wood. Snider wants to change that. 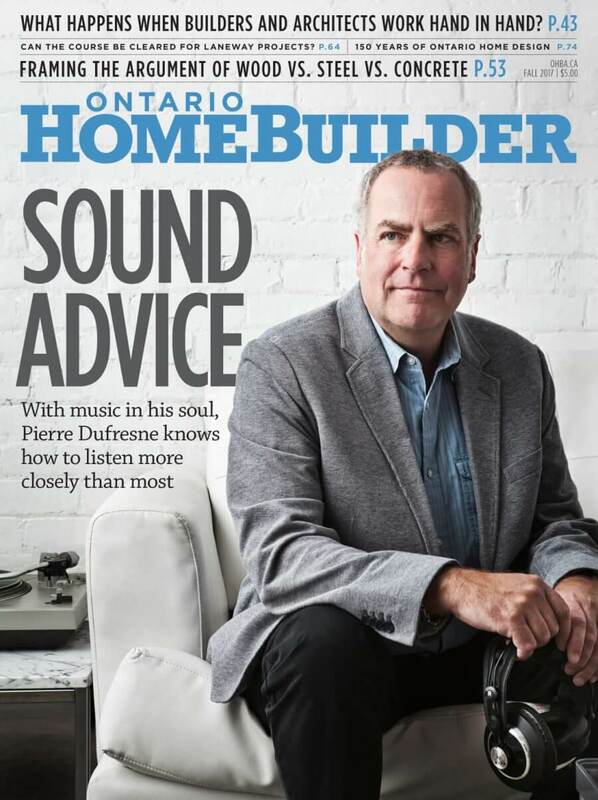 He seems a curious choice to be championing the concrete industry, given that he is a self-confessed “wood guy.” A carpenter by trade, Snider started up his own business at age 19 in Kingston. Over his more than 15-year career as a builder/contractor, Snider claims approximately 350+ custom-built, high-end homes—most made of wood. His switchover to concrete came when Snider was hired to build two homes and had to subcontract one to an ICF builder. That’s when he first saw the possibilities of concrete. Snider and Partners founded Nudura in 2001. Since then, the company has flourished, scoring high double-digit growth. The product’s energy-saving and environmental attributes have had a lot to do with it. “The ICF walls have two main benefits over conventional wood and steel frame walls: thermal mass and continuous insulation inside and outside of the wall,” Snider says. “Heat always moves to cold, whether you’re heating or cooling. It is either a gain condition or a loss condition, depending on the climate or season. Because of the thermal mass of an ICF wall, the heat flow through the wall travels at a significantly slower pace than it does through a cavity-frame wall. Unlike frame walls, the thermal bridging and air leakage is almost non-existent. Therefore, using an ICF will ensure that you will pay far less to maintain the desired temperatures within your living space. “On the environmental side, wood- and steel-cavity walls are prone to air leakage, and unless there is extreme care taken during construction, those leaks not only let air infiltrate your building but it also allows water vapour to become trapped within the wall,” Snider says. “If this occurs, the cavities become a prime spot for mould to grow and can cause significant structural damage if not found soon enough. Because the ICF walls are so airtight, the air leakage is almost nonexistent. Concrete and EPS do not support mould growth, and even if water manages to find its way through the exterior finish, it will not affect the structural component of the ICF wall. With the lower carbon footprint of concrete and the fact that most ICF’s are made from 50% recycled material and the waste is 100% recyclable, again it comes out a winner. For his part, before he became a devotee of steel, DiGiovanni was a gypsum and insulation guy. He, like Snider, understands the Ontario market and realizes the wood industry is huge. But that hasn’t stopped either from singling out the attributes of their products, and asking builders and contractors to give them a look-see. Green thinks history and the future is on the side of wood. As he pointed out in his TED Talk, 3% of the planet’s energy goes into the making of steel and 5% goes into the making of concrete. That makes the building industry the top offender of CO2 emissions, Green suggests. Builders are practical, and they have a nose for what a customer wants. If price, quality, speed of build and above-grade construction are equal or better by using concrete or steel, that’s where they’ll put their money. It’s up to people like Snider and DiGiovanni to convince them. As spokespersons for each sector, they are basing their pitches on years in the business. So far, their gains have been impressive. Nudura’s growth has Snider convinced that ICF is the building product of the future—at all build levels. He points out that the most energy-efficient schools in the U.S. are ICF (Some of Nudura’s more than 130 schools south of the border are net-zero projects). And other projects, like the high-rise market in Kitchener, are testimonials to the company’s products. At the residential level, Snider will be satisfied—for now—if ICF is used in basements. But he hopes, one day, entire tracts of suburban housing will embrace the product—right to the roof. Other projects in Ontario using Nudura’s ICF products include the Canada Summit Centre (Huntsville) built for the 2010 G8 Summit, now a recreational and leisure facility, as well as office buildings, apartments, condos and residential homes throughout the province. Ontario projects using Bailey steel include a trio of Toronto condos—The Bean, Sweet Life and Beech House—and the five-storey Seasons Retirement Residence in St. Thomas. Are Ontario builders and contractors willing to re-think the process and give materials like concrete and steel a fighting chance against wood? Markets shift and new products come to market, reminds Snider, who recalls his first ICF build in Napanee, a 2,500 square-foot bungalow with a walkout basement. It went from hole in the ground to roof-ready for mechanicals in two weeks. That helped convince him that ICF was a product whose time had come. Green, meanwhile, says forget six storeys—he wants to go even higher. And he has designed buildings that do just that. Green says developers should get their heads around the idea that the way we’ve built all structures over the years has to change. If building higher can be made safe (noting that the risk of fire can be minimized), why not use wood to reach to the sky—particularly when Mother Nature can keep replenishing the supply? What all of our experts agree upon is that the method of construction is changing, and that the next great revolution in the building industry will be a move from “building” to “assembling.” That means materials will be built-to-fit in factories in climate-controlled conditions and then shipped to project sites for assembly. It will save time and money, they note. In a way, every home or mid-size structure will be custom built. Wood, concrete and steel have all embraced the concept. It means future projects will have fully integrated design teams that monitor the process. In fact, it may usher in an era of hybrid buildings made of all three products. “There will be more innovative skillsets in the future,” says Street. That means more front-end work being done on materials. It also means an emphasis on the supply chain so that products can be sent to projects for quick and timely assembly. If Green has his way, wood will remain the dominant material. Its organic composition is one of its most sellable attributes in these environmentally sensitive times, but performance, solidity, ease of use, aesthetics and, of course, price will all remain considerations when builders and contractors choose a material for construction, he says. But then all three sides are pretty good at framing their arguments.